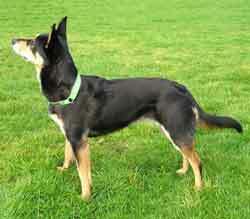 The Kelpie was developed in Australia for herding sheep. They are medium-sized dogs and come in a variety of colors. Kelpies have been exported throughout the world and are used for herding cattle as well as sheep and other livestock. Kelpies are compact, enthusiastic, and tireless, always ready to work. . The Kelpie's coat has a thick undercoat and a short weather resistent outer coat. Coat colors include black, chocolate, red, blue, fawn, red and tan, and black and tan. The dog's color has no relationship to his working ability, so ranchers looking for working dogs usually disregard the dog's color. The breed is most likely across between Scottish sheepdogs and old style smooth-haired collies and with possibly a little dingo in the mix. Kelpies use "eye" like a Border Collie on gentle stock but uses its nipping ability on stubborn cattle. They can work unsupervised, relying on their own wits to locate and gather cattle. Kelpies make excellent watchdogs. They are an active, intelligent breed which become easily bored and need to be provided with lots of interesting things to do or they may develop serious behavior problems. 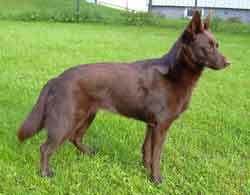 A medium sized dog Kelpies stand between 17 and 21 inches at the withers and generally weigh from 25 to 45 lbs.